It's been another bad week for rail commuters - fare rises; chaos after a crane collapsed near Britain's busiest station, Clapham Junction; and all the other usual delays. Jon Yuill was elected by BBC News Online readers to speak up for rail commuters. After two years of complaining about the railways in these pages, he got his chance to question the man in charge, Transport Minister Kim Howells. 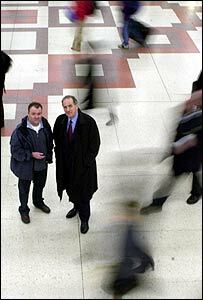 They met at London's Victoria Station. Jon Yuill: As we sit here today, a lot of fares are going up - some by over 4% - way above inflation, in fact. Has it ever occurred to anyone that to encourage people on the trains, perhaps we could decrease the fares? Kim Howells: Yes, we thought a lot about this and although we don't really have a say, I guess, in how much a company increases its fares, there's only two places the money can come from: public subsidy, or the fare box. The big problem is, we're asking commuters to pay a bit more but they don't see they're getting a much better service. And if they were getting a better service, probably they'd feel less offended by those increases. JY: Our train companies are geared towards making a profit, but don't you think there are certain things in a society, like public transport, which should not be run along profit-making lines? KH: First of all, we ARE funding the country's rail system because the biggest part of the cost of running the railways comes from the taxpayer and we're putting now about twice as much into the railways as six years ago. This year we'll probably put in about £3.5bn under the taxpayer and probably not quite as much again will come from the private sector. We've got to spend our money better and that's why, for example, Network Rail took maintenance back in-house. When I came into this job, the calculation on the cost of rebuilding the West Coast Main Line was £13.5bn - it's now about £9bn. When it started it was about £2.5bn. That's an indication of just how confused this industry was, under Railtrack, and to some extent, remains. 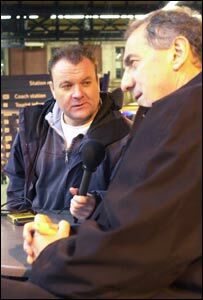 JY: So bearing all that in mind, do you think the average commuter gets value for money on today's rail network? KH: The one thing I don't know Jon is how fares compare with other countries. I suspect there's not such a huge difference between the two, although my own experience of, say, Swiss railways, is that you get cleaner trains. They're slow but very, very punctual. JY: What gets people's goat is that the government has been in charge of the railways, as it were, for seven years and yet punctuality is worse now than in 1997. With one in five peak-time trains running late, when will it get better? KH: I can't tell you that Jon. I'm determined it's going to be sooner rather than later. The way the industry is organised is the most fragmented imaginable and the chains of command are very, very long. I've yet to see the logic of the decision at privatisation to break the link between track and trains. It's an impediment to better reliability and punctuality. There are ways of overcoming that, but they're going to mean some pretty big changes. I think we're up for that and we've got to try very hard and very fast to work out whether we can institute those changes, along with better management, to get many more trains coming in on time. JY: I had an e-mail from a chap who works on the railways, who told me the line of accountability now is very confused, so nobody fears what will happen if they don't do their job properly. KH: Accountability is crucial and when passengers don't know who to blame, governments love that. They say, it's not us guv, it's the Strategic Rail Authority (SRA) or Network Rail or the train company, or a freight company. We need short chains of command. I'm very much in favour of reintegrating the rail system - the relationship between the train operators and the tracks. JY: Why don't you just renationalise the railways. At least people knew who they were accountable to. 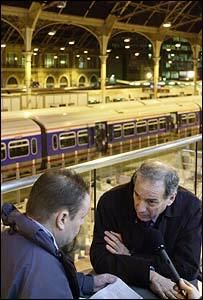 KH: Yes but that didn't stop the trains being late and filthy and so on. One of things that we've been able to do, over the past five to six years is place the biggest order in British rail history for new rolling stock. Then we discovered there wasn't power on the tracks to run these trains. That was an example of the fragmentation. JY: So who was responsible for that and are they still in a job? KH: Well I don't know. It's costing us £1bn of taxpayers' money to upgrade the electricity supply of the old Southern region to guarantee this new rolling stock is going to run properly. The old slam-door trains - now condemned - used very little electricity. JY: Well I think most people who travelled on them thought they used clockwork. But you're the one with the power to make these changes. Are you saying we're going to see a reintegration of the railways? KH: I'm looking at how it might be possible for us to organise this industry in a better way than it is at the moment. More news on that subsequently. JY: And you think that means bringing the rail companies and the infrastructure outfit together as a some sort of single company? KH: There's a lot of contrast in the way the railways are run in this country. Some very good companies that are running very good services. I'm interested in trying to figure out how the best companies can set an example. JY: Are all the safety systems promised by John Prescott, now in place? KH: Well we've now got the train protection warning system 100% throughout Britain which is a remarkable achievement. In terms of automatic safety systems, I think we have the safest railway lines now in the world - certainly on mixed freight and passenger lines. JY: I'm told you are keen cyclist. On these new trains even, there's no room to put bikes at peak trains. And quite often you are encouraged not to take bikes on trains. Is this "joined up" transport thinking? KH: I've been urging the SRA to be more vigorous in its policy towards integrating cycling. It's very difficult during rush hour because there's a premium on space but I guess the way of overcoming that, at least at one end of the trip, is to have decent lockups for bikes. JY: We used to have half a carriage somewhere in the old days where a guard would sit where you could put five, 10, 15 bikes but that's not there any more. KH: No, it's gone now. KH: Yeah, it's kind of gone out fashion really and I find that very paradoxical at a time when more and more people are cycling. JY: So you will try and do something about that? KH: Yeah, I'm trying. It's important. But also the car thing is very important too. The more park and ride we have, the less congestion we'll see on the roads. And people have to feel safe about those car parks. JY: On the security front, what are your thoughts on having someone - I'd call them if you like, a super-staff - who walks up and down a train helping passengers, selling them tickets, and keeping and eye on trouble makers? KH: Yeah, I'm very sympathetic to that idea. At the moment the train operating companies have to decide what staff they're going to put on the trains and some of them have got a lot of staff on. A lot of the London commuter services however, have gone to driver-only trains and increased platform staff at big stations. JY: Which doesn't help people when you're actually on the train. When those doors shut, you are pretty much a prisoner. I've been in a situation where you get drunken yobs threatening and intimidating passengers. One driver at one end who never gets out of his cab is no good. 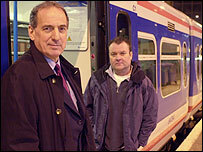 KH: I don't think we can make them put these super-staff, as you described them, on the trains. But I would certainly encourage them to do it. JY: I've had thousands of e-mails through the BBC News website saying why don't railway staff talk to us. We sit on a train, going nowhere in the heat or freezing cold, nobody communicates with us. How can you improve that? KH: There is no excuse for not keeping customers informed on trains - absolutely no excuse at all. The best of the companies have recognised that and they're doing it. For those that don't, its poor management; shoddy; very unprofessional. We're trying to encourage companies to adopt best practices. JY: It's interesting you used the terms customers because what cheeses a lot of people off - we're not actually customers, we're passengers - customers have a choice, we have no choice, we have to get that train. So you think 2004 will be a better year than 2003 for commuters and rail passengers? KH: Yes - if I didn't I'd find it even more difficult to sleep at night than I do now. "I've yet to see the logic of the decision at privatisation to break the link between track and trains" So what's with the government's insistence the Public Private Partnership on the Tube is going to make it better? The minister's replies were a lot of "I'd like to see..." but no firm proposals. If the train companies keep making profits as a result of public subsidies, isn't it time he cracked the whip? Otherwise it's all just the same political waffle that we always hear. "One of things that we've been able to do, over the past five to six years is place the biggest order in British rail history for new rolling stock. Then we discovered there wasn't power on the tracks to run these trains." Is Kim Howell's trying to take the credit for a costly error? I'm amazed that with all the government's Euro-talk he admits he has no idea what happens abroad. perhaps he should find out. On the crucial question "when will it get better" Mr Howells' reply is woefully inadequate. The minister's assumption that fares abroad are not so different from over here is simply wrong. It's ridiculous that I can fly to New York for the price of a ticket to Yorkshire and back. A simple way to introduce copmpetition on price would be allow all train companies to sell tickets for each other's services. There are far too many "don't knows" in Mr Howells answers. It's his job to know. An interesting interview with good questions and honest answers. I did get the feeling however, that despite genuinely wanting to improve the service we get, Mr Howells has his hands tied and limited effective power. If the minister cannot get things done what chance the poor punter on the 0815 to Glasgow Central? There is no way any "super staff" would be able to walk up and down the train, what with the aisles being blocked by commuters paying full fare for the chance to stand all the way into London every day. Kim Howells seems to know very little. He doesn't know how our fares compare to those in other countries; when the trains will improve; or who was responsible for ordering new trains without sufficient power to run them. These are things that any transport minister has a duty to know. All the minister seemed to be saying is what he thought we wanted to hear. His replies were full of "We're trying to encourage companies..." but very little hard facts. After 18 years in Switzerland of taking the trains almost every day, I can safely say that the trains normally pass the car travelling on the autoroute. They are very fast, and yes clean. And with a half-price card, it is very affordable to travel by rail. When are we as passengers going to take responsibility for our own problems? We want more staff on trains, we want to pay less for trains, we want the government to put more money into trains, we want to pay less tax, we wanted the trains privatised, now we want them taken back into public ownership! The Minister says he "does not know" rather too much for my taste. Surely he should be a little better informed about a subject that is his specific responsibility?